There aren't many car chargers that support Qualcomm Quick Charge 3.0. 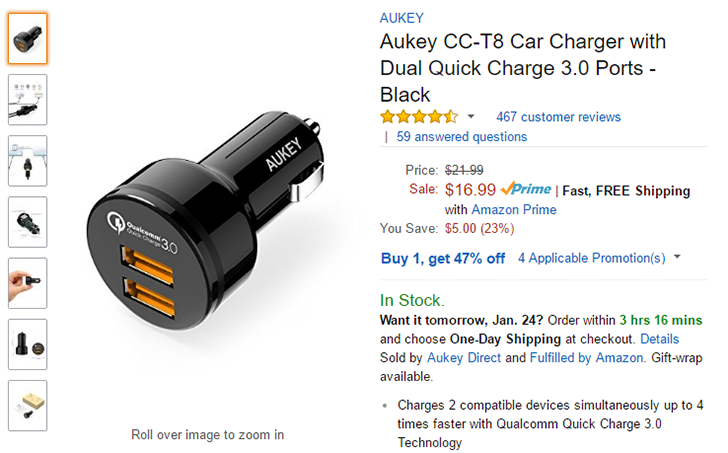 Aukey's CC-T8 car charger has not one, but two QC3.0-compatible USB ports capable of an output of 2.4A each. Now you can get it for only $9 on Amazon after a special code. Once you add the car charger to your cart, simply add the code OHBVOTE9 at checkout to receive 47% off the total price. Android devices that support the faster charging include the LG G5, HTC 10, LG V20, and more. Like all QC 3.0 chargers, it is backwards-compatible with QC 2.0, and of course will work with all your other USB devices as well. You can get the CC-T8 charger at the link below, and see the promotion details for all the terms and conditions.